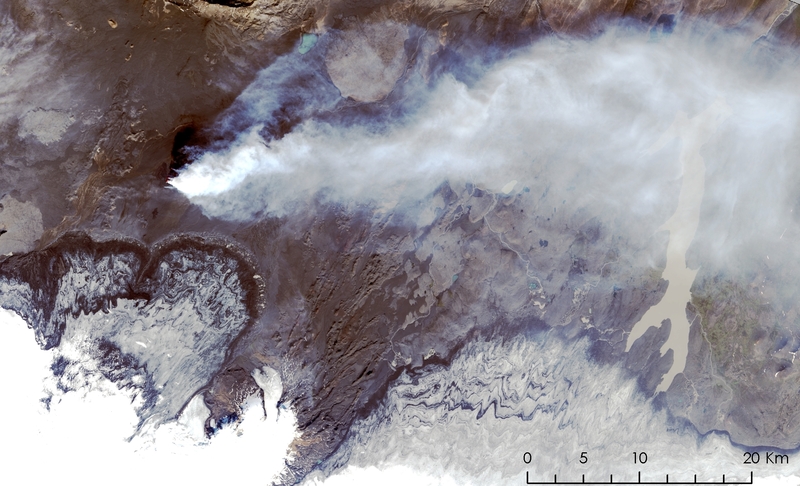 Featured image: NASA/USGS TrueColor Landsat 8 image of Bardarbunga and Halslon Reservoir, September 6, 2014. Iceland’s temperamental geography has gone haywire again with Bárðarbunga, the latest volcano to erupt under the Vatnajökull ice cap. 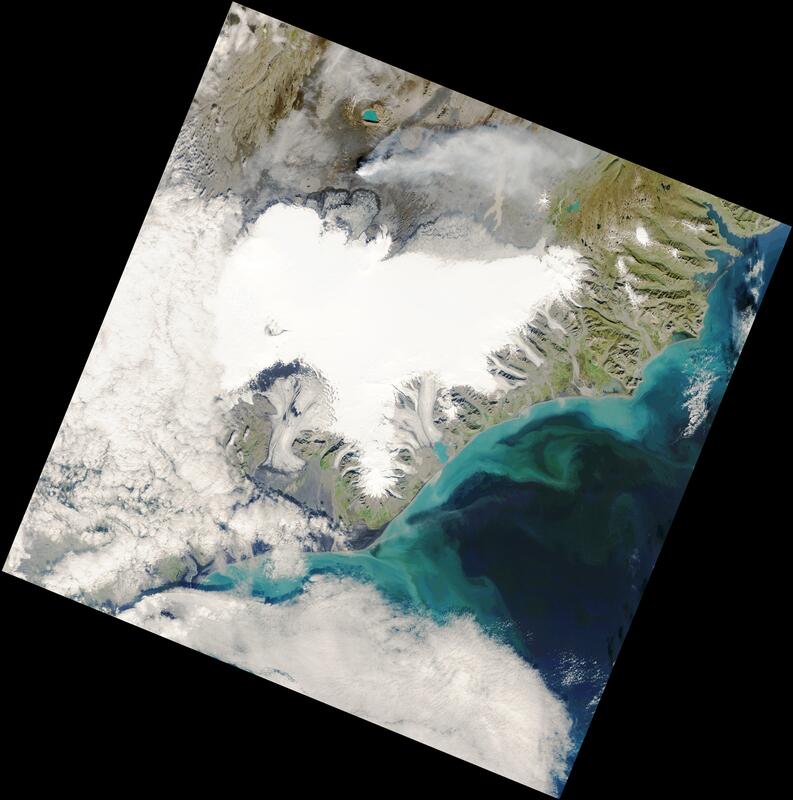 It’s no secret that Iceland is the land of fire and ice, and the above remotely sensed image from NASA’s Landsat 8 satellite captures those elements beautifully (link to full resolution). September 6 proved to be a clear day over southwest Iceland, allowing the ice cap to visibly stand in stark contrast to the streak of red hot lava flowing just to the north of it. The two enormous craters that have appeared in the ice cap are also visible, which Ben Orlove writes about in more detail over on Glacier Hub. It’s thought that the ice may have subsided due not to melting, but rather to the movement of magma underneath the ice. 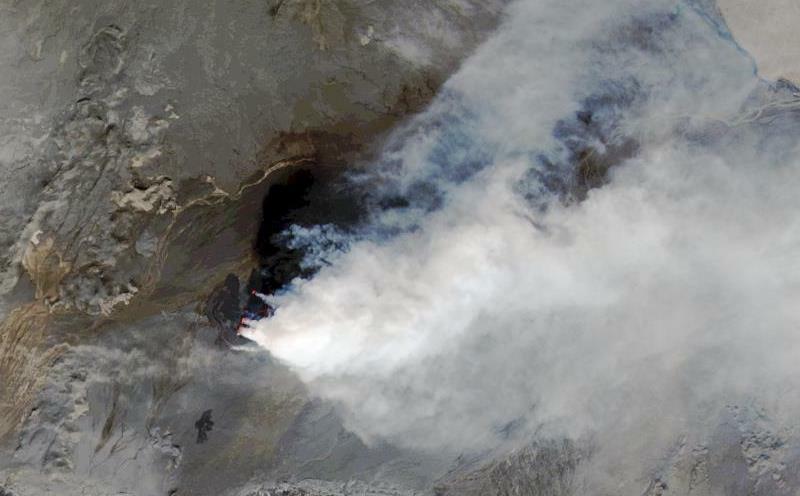 A few day prior, with its Earth Observing-1 satellite, NASA also captured some additional high-resolution images of the volcano and lava lake. 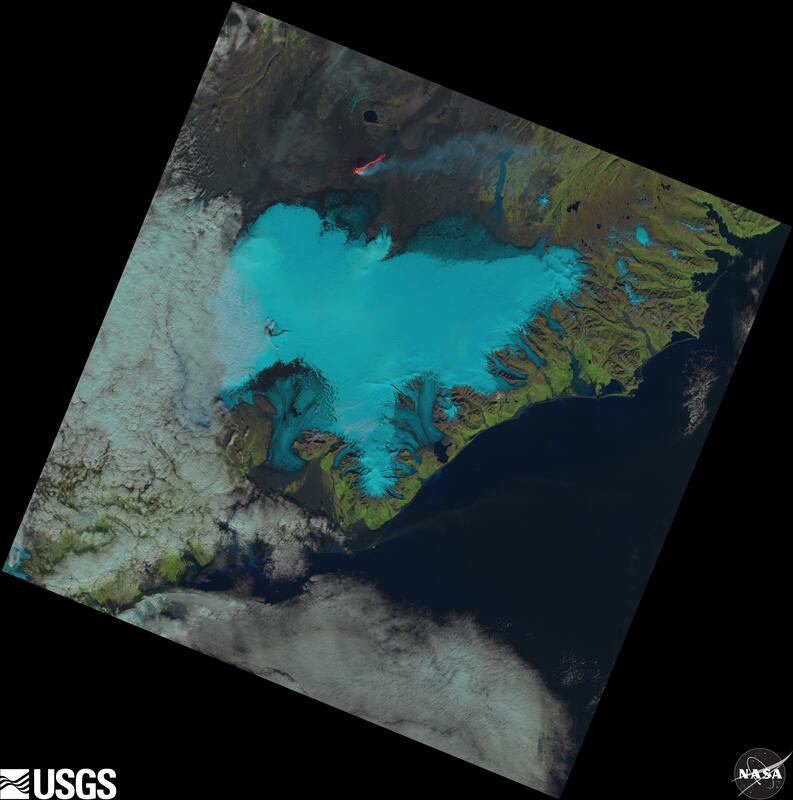 Note that in the image above, NASA/USGS has rendered the colors so that the ice cap appears nearly blue. When I processed the image (link to full resolution), the ice cap appears white, but since I was unable to remove the smoke, the lava field is not as visible. I also generated a thermal image, below, using Landsat 8’s band 10. The lava field is definitely hot – especially when compared to the cold ice. Landsat 8 thermal image (Band 10) over Bardarbunga and Halslon reservoir. 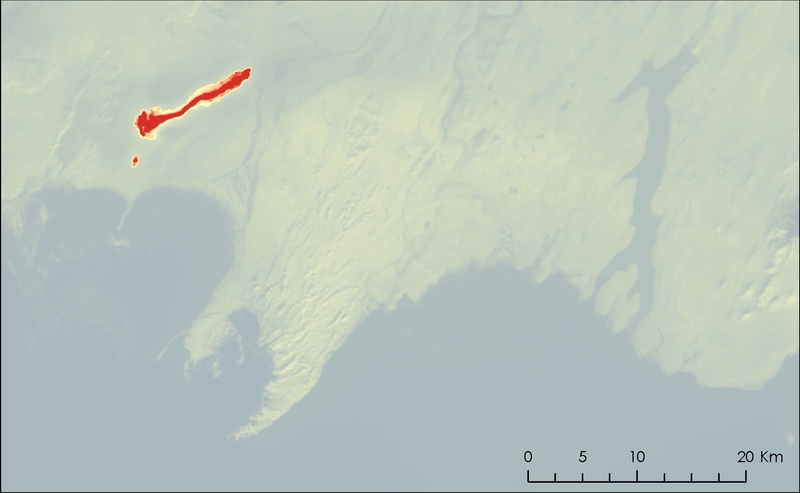 My rendering of the Landsat 8 image over Bardarbunga and Hálslon Reservoir. September 6, 2014. Image: NASA/USGS. There’s a lot more to this picture than just the lava field, however much as it catches the eye, for the satellite image contains both fire and water. On the right side, there is a feature that looks like big spindly lake, which is actually a giant 57-square kilometer reservoir. Called Hálslon Resevoir, this artificially-created body of water didn’t exist prior to 2006, when the area was deliberately flooded during construction of a huge dam, known as the Kárahnjúkar hydropower plant. The Icelandic government’s decision to build this facility and associated aluminum smelter in Reyðarfjörður (east Iceland), owned and operated by the American company Alcoa, was one of the most controversial decisions in Iceland in recent years. The government even contradicted a recommendation by the Icelandic National Planning Agency not to move forward after it determined that there would be numerous negative consequences for the environment in its impact assessment. The government’s decision in favor of construction resulted in numerous protests and even a documentary called Draumalandið (Dreamland). A short clip of the film, which shows why people were so angry, is available on YouTube. Aluminum production is extremely energy intensive. One kilogram of the material takes 18-26 kilowatt hours (kWh) of energy, whereas steel only requires 6 kwH, so companies naturally want to locate near powerful and clean sources of energy, like Iceland’s churning glacial rivers. Hydropower is not as environmentally friendly as it may seem, however, especially when it necessitates the flooding of land into which numerous Icelandic lava lakes could fit – not to mention pink-footed geese and caribou, species whose habitat was reduced by the reservoir. But many of the powers that be in Iceland, from the state-run energy company, Landsvirkjun, to the country’s banks, have a vested interest in hydropower and aluminum production. Aluminum – not fish – now represents Iceland’s single biggest export. Bjarni Mar Gylfason, chief economist for the Federation of Icelandic Industries, once noted, “We export energy in the form of aluminum.” Until subsea cables are built to the United Kingdom, there are few other ways ‘s simply no other way for Iceland to feasibly export its excess energy. “Kárahnjúkar” became a byword for what many perceived to be the sell-out of the Icelandic government to developmental interests. Some have even hypothesized that the huge amount of foreign capital that flooded the country to fund the construction of the project could have been partly responsible for the Icelandic financial crisis in 2007-2008. A consortium of banks, including the UK’s Barclays, lent $400 million to Landsvirkjun to finance Kárahnjúkar ‘s construction, which cost over a billion dolars. As a consolation prize for environmentalists and others who contested Kárahnjúkar for so long, the Icelandic government created what’s now the largest national park in the country: Vatnajökull National Park. Within the boundaries of this very park, Bárðarbunga is belching out its ash and lava. Had the volcano erupted some 44 kilometers to the east, it would have been right under the Hálslon reservoir, though the distance is almost too close for comfort as is. In the satellite image, you can see the ash cloud billowing out over the man-made lake. That ash cloud could deposit sediment into the reservoir, theoretically shortening the lifespan of the Fljótsdalur hydropower plant downstream. Sedimentation is already a potential problem for Hálslon due to the mineral-rich glacial rivers that feed into it. Once too much sediment becomes trapped in a reservoir, it can no longer provide as much power as intended. 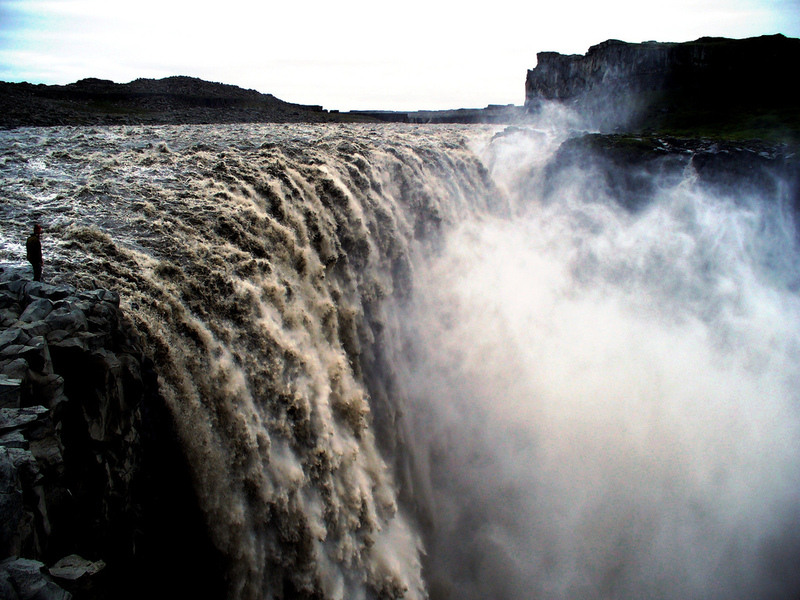 If Hálslon Reservoir overflows, it can generate a waterfall more powerful than Dettifoss. Photo: Flickr/Richard Gould. So much for Iceland being a land of wild, unspoiled nature. Man’s ability to build things more powerful than some of the strongest forces in nature is both awe-inspiring and terrifying. What might also fall under those two descriptors is research currently being done by scientists with the Iceland Deep Drilling Project, who have managed to produce geothermal energy from magma. I can already see the commercial opportunities abounding for aluminum products. Perhaps “Coca-Cola cans: forged by volcanoes” will do. A close-up of the ash cloud and underlying lava. Will they one day power the production of soda cans? September 6, 2014. NASA/USGS. The satellite images shown above is really astounding and impressive! This high resolution data with lots of image features really impressed me a lot. This kind of satellite imagery is really best option to those people who needs to gather a high resolution satellite images and could really help them to their research and other related studies. Great article!